Born in Newcastle-upon-Tyne in 1964, Lucy Gunning studied at Falmouth College of Art (1984-87) and Goldsmiths College, London (1992-94). She has exhibited in the UK London, and internationally. Group exhibitions include the British Art Show 5 (2000-01) and Big Bang, at the Centre Georges Pompidou, Paris (2005). In 2004 she was awarded the Paul Hamlyn Foundation Award for Visual Arts. Gunning works primarily with film, video, installation and performance. Architecture, context and behaviour are central to her practice. Psychological and physical space are explored, through juxtaposition of documentary footage, choreographed events, installation and sculptural devices. In 2007 Gunning created ‘The Archive, The Event and its Architecture’, a multi-faceted work that resulted from her experience as artist-in-residence at the Wordsworth Trust, Cumbria. The work included a publication and three events, a walk involving mirrors, a symposium and an event at the village hall, at which all the regular village hall activities were carried out simultaneously. Also in 2007 she created RePhil, an intervention with the collection at the Philbrook Museum of Arts in Tulsa, Oklahoma. She is represented by Matt’s Gallery, London and is a Senior Lecturer at Chelsea College of Art & Design. 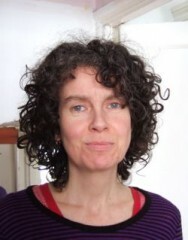 She is currently the 2011/13 Fellow at the Kenneth Armitage Foundation.